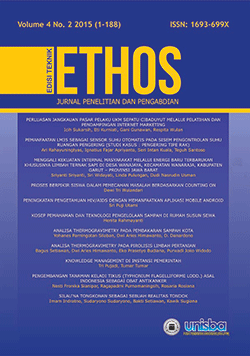 Unisba Electronic Journal or is an online journal settings and system publications issued by the Bandung Islamic University. The portal was built and developed by P2U (University Publishing Center) LPPM Unisba for the benefit of interconnect resources and scientific work as an effective tool in disseminating information to the whole society, especially academics and researchers. This service is provided free of charge and intended as a medium of dissemination of scientific articles that can be accessed by the public and is expected to be a positive contribution to science in the wider community. Scientific Publication is expected to create a forum for communication and open discussion space for researches in the field of science concerned. This system has been set up for anyone who can register themselves through the system to get an account and paswordnya and send the article to be indexed. 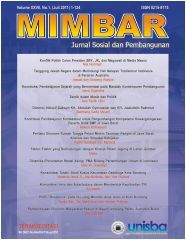 Journal Mimbar is a scientific journal dedicated development and social, media as the result of a scientific study and devotion in the field of research, analysis and critical assessment of the contemporary development issues. Accreditation Number: 10/E/KPT/2019 until 2024, Ranking Sinta 2 Indexed by DOAJ, Crossref. Sinta, etc. The Global Medical and Health Communication (GMHC) is a journal that publishes medical and health articles since 2013. Articles are original research that needs to be disseminated and written in English. In not so long time, GMHC journal published by Faculty of Medicine, Universitas Islam Bandung have already accredited by Ministry of Research, Technology and Higher Education of the Republic of Indonesia Number 2/E/KPT/2015 since 1st December 2015 with Sinta (Science and Technology Index) Score is S2. It’s also indexed in Directory of Open Access Journals (DOAJ) on 9th May 2017 and Crossref on 2nd January 2018, with DOAJ and Crossref indexing this journal are able to reach international audiences. This achievement received positive responses from researchers, lecturers and health observers alike showed by articles submitted which are triple compare to the number of articles received in its early time. The quality of the articles also show improvement both in methodology and written that will be beneficial for audiences. Research findings were best to disseminate as early as possible so they can be used properly. To support these GMHC publication which was every 6 (six) months in a year will publish every 4 (four) months in one year starting from 2017. The news from science and health about challenges and opportunities in Indonesia is still very quiet that GMHC hopes to become the best means to support researchers, lecturers, and health practitioners to become the voice of Indonesia, especially in health. Academic journals that adhere to the highest standards of peer review. The journal is centered in the research and dedication in the science and technology field. The character of the journal are open and contribute to the results of research and dedication and represent of guiding belief in characterizing the community, nation, or ideology with the use of science and technology. First published in 2001. This journal focusing on communication research, theories, systems, methods, policies, and applications in communications, bringing to its readers the latest, broadest, and most important findings in the field of communication studies. Mediator, as scholarly journal of communication provide a high profile, leading edge forum for academic researchers, industrial professionals, consultants, managers, educators and policy makers working in the field to contribute and disseminate innovative new work on communications. All papers will be blind reviewed and accepted papers will be published twice a year which is available online (open access) and in printed version by request. From Volume 6, No.1 (June 2005), Mediator acquired the predicate "Accredited" by SK DIKTI No. 26/DIKTI/Kep/2005 until 2008. Since Volume 10, No.1 (June 2017), Mediator re-published by online-based. Economic system increasingly showed incompatibility with islamic law. So this requires assessment of the values of the ongoing economic system , so it can be adapted to economics and Islamic finance. 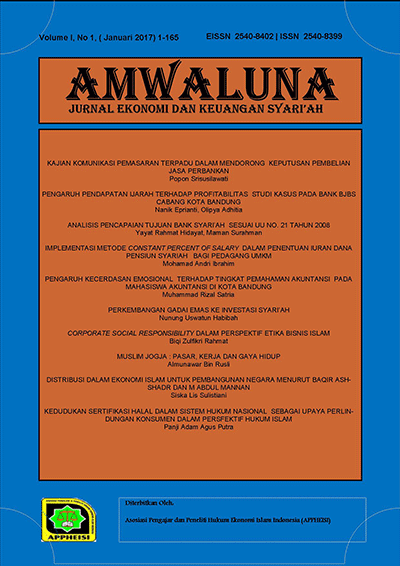 Amwaluna journal of economic and Islamic finance is a journal Prodi Muamalah Faculty of Syariah Bandung Islamic University, published two times a year , namely in January and July is dedicated as a medium in order to facilitate the academics , practitioners and students to conduct research in economics and Islamic finance thus contributing to the advancement of science, especially in the field of economy. Dinamika Ekonomi: Jurnal Kajian Ekonomi dan Pembangunan. Program Studi Ekonomi Studi Pembangunan Universitas Islam Bandung. Manajemen Universitas Islam Bandung. 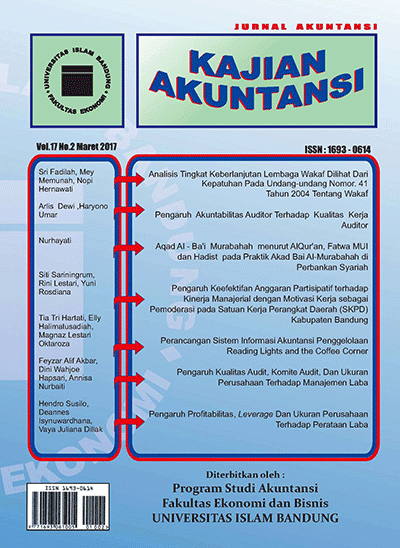 Syiar Hukum is academic law journal published by Faculty of Law, Bandung Islamic University (UNISBA) two times a year in March and September. The accepted articles will be available online following the journal peer-reviewing process. Language used in this journal is English and Bahasa. 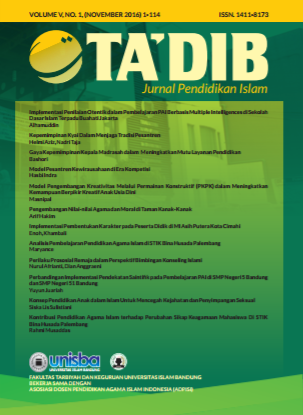 Ta'dib Journal: Journal of Islamic Education published since 2000 which is managed by the Faculty of Tarbiyah and Teaching Bandung Islamic University, published twice within 1 (one) year, in May and November. This journal focuses on research related to the issue of Islamic religious education. Since 2017, research articles received following the online peer reviewers process. The languages used are English (abstract only) and Indonesia (Abstract and Article). 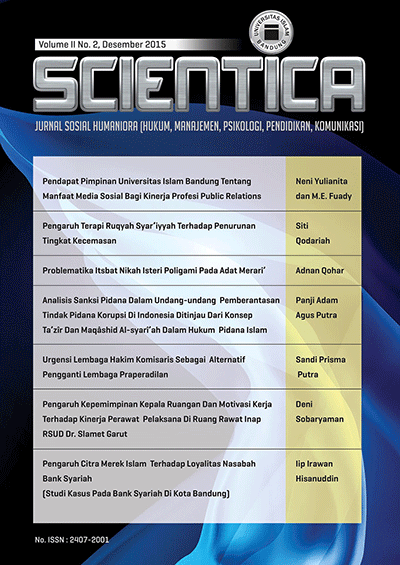 Performa: Jurnal manajemen dan bisnis. Program Studi Manajemen Universitas Islam Bandung. Manajemen Universitas Islam Bandung. 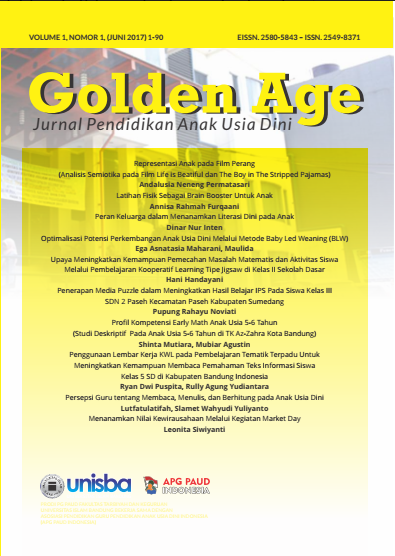 Jurnal Performa menerbitkan artikel dan komunikasi singkat dengan tema Manajemen (Marketing, SDM, Keuangan, Operasional), dan Kewirausahaan. Jurnal Performa terbit dua kali dalam satu tahun, yakni pada Bulan Maret dan Bulan September. Naskah selambat-lambatnya dikirim pada awal Bulan Februari dan atau Bulan Agustus. Tidak ada biaya publikasi untuk setiap naskah yang diterima. Naskah dapat ditulis dalam Bahasa Indonesia dan Bahasa Inggris. Semua penulis diharuskan mensitasi artikel dari performa sesuai degan bidang yang dikuasai. Semua naskah di-review oleh 2 orang mitra bebestari secara anonim, di mana identitas penulis dan mitra bestari dirahasiakan. Setiap penulis harus submit artikel saat registrasi pada http://ejournal.unisba.ac.id/index.php/performa. 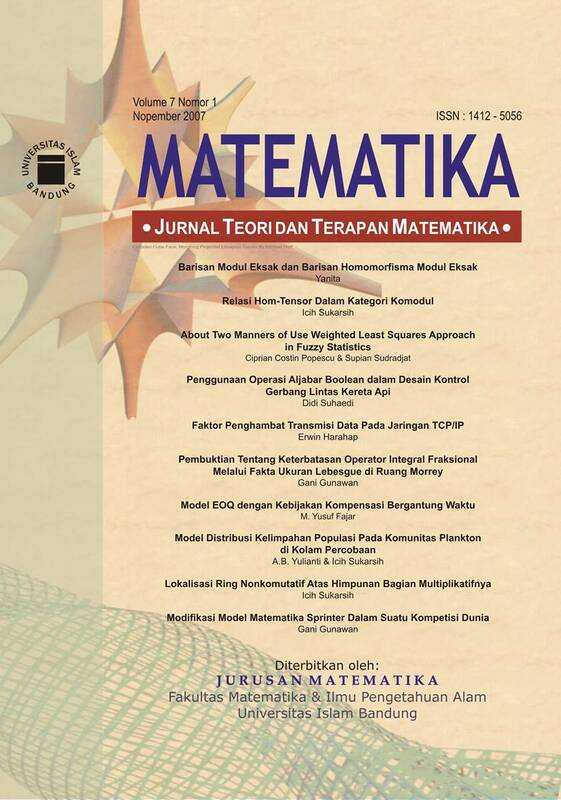 JOURNAL MATHEMATICS, Journal of Theory and Applied Mathematics is a periodical journal published by the Mathematics Study Program, Faculty of Mathematics and Natural Sciences, Islamic University of Bandung. The Journal of Mathematics is published at least 2 times a year, on June and November. The issue of Mathematics Journals managed by the Mathematics Study Program is in Book and Online format. The scope of content for articles published in the Journal of Mathematics covers the theories as well as applied Mathematics in various fields such as: Humanities, Economics, Computers, Dynamic Systems, Natural Sciences, and so forth. Journal's articles can be submitted to the manager's contact address Journal of Mathematics. This journal is managed by the Early Childhood Education Teacher Education Study Program which focuses on research results related to early childhood education. This journal is published 2 (two) times a year, in June and December. 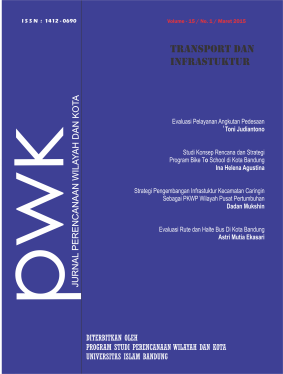 This journal is expected to be accredited by Kemenristek Dikti, Republic of Indonesia. The incoming article will be reviewed by 2 reviewers. The language used is English (abstract only) and Indonesian (abstract and article). 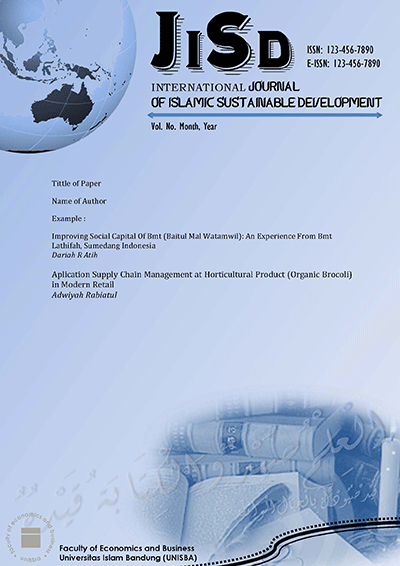 Journal of Islamic Sustainable Development (JISD) is an international, double-blind peer-reviewed, open-access journal published by the Indonesian Association Of Islamic Economists (IAEI) and Faculty of Economics and Business, Universitas Islam Bandung. JISD carries original and full-length articles that reflect the latest research and development in both theoretical and practical aspects of sustainable development in islamic perspective. It provides the knowledge and ways for all development stakeholders to achieve Sustainable Development Goals 2030. Mitra Gender adalah Jurnal Kajian Gender dan Anak. 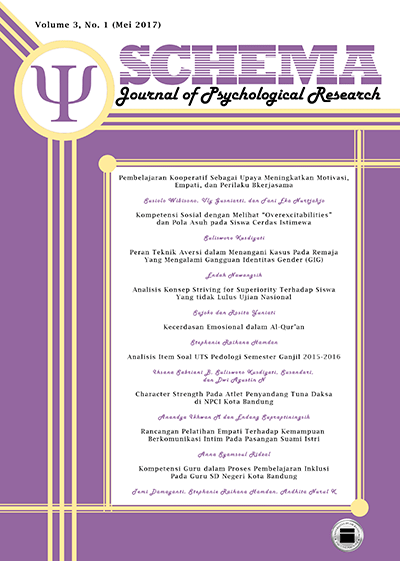 Jurnal Kajian Gender merupakan jurnal yang berupaya menghadirkan info dan isu tentang gender dan anak yang terus berkembang dari tahun ketahun. Isu perempuan, anak dan lansia, defabel dalam bidang pendidikan, keluarga, politik, ekonomi, budaya dan sosial, hingga persoalan-persoalan lainnya responsif gender. This journal contains papers / scientific articles in the field of urban and regional planning or related to the essence of urban and regional planning. This article through a review by the Editorial Board of the Journal of Urban and Regional Planning Bandung Islamic University. Editorial: Jl. Tamansari No.1 Bandung. Tahkim adalah jurnal ilmiah yang dikelola dan diterbitkan oleh Prodi hukum Keluarga Islam (Ahwal Asy-Syakhsiyyah) Fakultas Syari'ah Universitas Islam Bandung. Tahkim diterbitkan dua kali setahun, yaitu bulan Maret dan Oktober. Tahkim fokus pada bidang hukum Islam yang meliputi hukum keluarga islam, Sejarah, hukum perdata Islam, hukum pidana islam, fiqh-ushul fiqh, kaedah fiqhiyah, masail fiqhiyah, tafsir hadis ahkam ataupun hasil penelitian yang relevan. Address: Jl. Tamansari 1, Bandung 40116, Jawa Barat, (022) 4203368 pes. 313, (022) 4263895. Jurnal ilmu ekonomi, akuntansi dan manajemen universitas islam bandung. Ged. K.H. Z. Muttaqien, Jl. Tamansari 1, Bandung, Jawa Barat, (022) 4264064, 4203368 pes. 146.